Rocket.Chat is one of the most popular open source chat applications. A great alternative to both Slack and paid live chat applications. It’s free, everything’s unlimited and it has a bunch of cool features like Video chat, Screen sharing, Mobile apps and more. In this tutorial, we’ll focus on the live chat option that Rocket.Chat offers, not the Slack-alternative team chat option, although it’s really great and you should try it out. In this tutorial, we’ll install Rocket.Chat on an Ubuntu 16.04 server with Nginx as a reverse proxy and add it to our WordPress site. 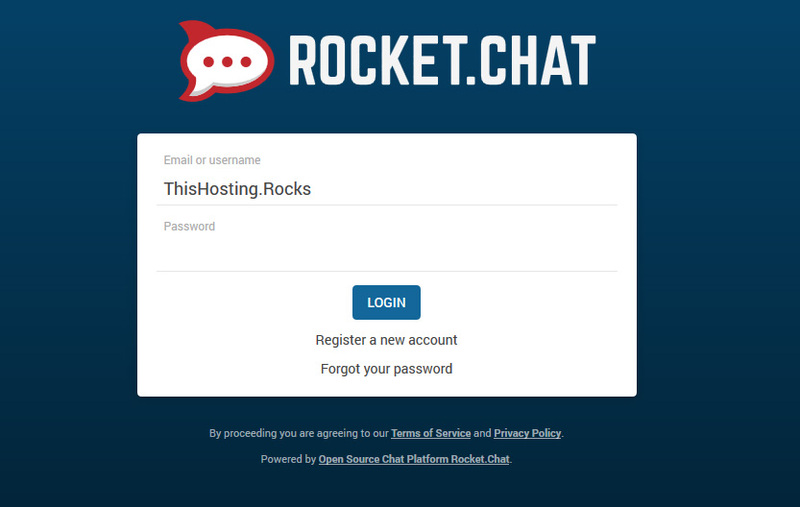 Rocket.Chat is a self-hosted application, so you’ll need a VPS/Dedicated Server. Usually, shared hosting accounts don’t allow the stuff you need to run Rocket.Chat, so you’ll have to get a VPS for this. You can either get a cheap unmanaged one or a cheap managed one. (Optionally) A WordPress site. Of course, you can still use Rocket.Chat without WordPress, but for the purposes of this tutorial, we’ll assume that you already have a WordPress site. The server needs to have at least 1GB RAM (although 2 or more is recommended). You can get a 1GB RAM VPS from Linode or Vultr for $5/month. Now that we got the requirements out of the way, let’s go to the installation. Now we’ll move on to the database. Rocket.Chat uses MongoDB as a database server. That’s it. We installed MongoDB. By using a ReplicaSet, you’ll greatly improve the performance of your Rocket.Chat. If the value of “ok” is not 1, then something’s wrong. Please go back and follow the steps exactly as shown in this tutorial. Now let’s move on to Node.js. We previously installed npm and Node.js, but now we need to do the necessary configurations. You are done. Now let’s configure Nginx as a reverse proxy. We’ll run Rocket.Chat on Nginx with an SSL. We already installed Nginx in our first step of this tutorial. And add the actual Nginx configuration below. Make sure to replace the IP, port and domain name to the stuff you use. You can get a .chat domain from Namecheap. Almost done. Now let’s reconfigure Rocket.Chat to run with our new domain. We’ll need to update the variables we added before with our new data. Now, open your domain name in your browser and register a new account. Rocket.Chat will ask you if you want to update your site’s URL, click “Yes”. And you are done with installing Rocket.Chat. If you want to configure Rocket.Chat to run forever, without needing to initiate an SSH session each time you want to run it, you’ll need to use the node module ‘forever-service’. Contact our support team if you want us to do this for you. Now let’s move on to integrating it with WordPress. First, you need to enable the Live chat option in your Rocket.Chat. Enable the live chat option from here and update all the settings according to your needs. There are quite a lot of options, so go through them and see what you want to change. Click on ‘SAVE CHANGES’ after you are done. Now, let’s configure WordPress to show our Rocket.Chat live chat widget. There’s an official Rocket.Chat plugin for WordPress. Download and install the plugin. 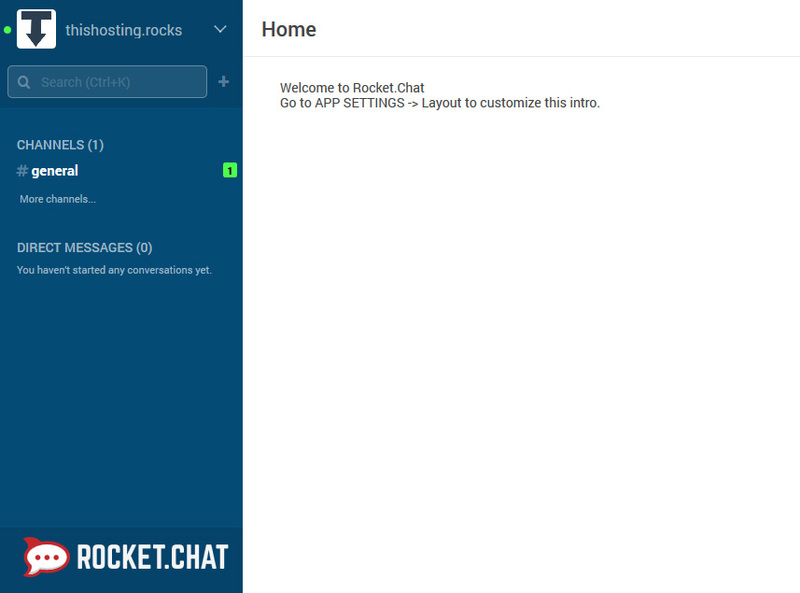 Then, navigate to Settings -> Rocket.Chat LiveChat and enter the URL of your Rocket.Chat (https://example.chat). Click save. And you are done. Now you have Rocket.Chat enabled on your WordPress site. That’s all! If you need any help, feel free to leave a comment below or contact our support team and they will do all this for you. I am from the Rocket.Chat team. First off wanted to say thanks for writing an tutorial. Great writing. I would recommend one change to your tutorial though. You currently suggest that people comment out the bindIp line in their mongo config. Doing this actually exposes mongo on every ip address on the machine. This includes the public IP of the machine. If you don’t have a firewall in place, this means your database is exposed to any and everyone on the internet. We strongly recommend against this. Currently a trend going on where people are scanning the internet for exposed mongo servers and actually attempting to hold users data for ransom. Also to note.. localhost resolves to 127.0.0.1 so leaving on 127.0.0.1 should also be fine.